GO: Good guy, '60s maven and author Ralph Gowling sent a sneak preview of a piece he penned for the August issue of The Beat, spotlighting Liverpool's Shakers and leader Tony O'Keeffe, who, as you'll recall, opened my 9 May birthday celebrations at the Amersham Rock 'n' Roll Club. The Shakers must be one of the most unique groups on the '60s circuit. This is no tribute band to The Beatles or any of the other Merseybeat greats. The Shakers have their own image and produce the sort of high-octane performance that was last witnessed at The Cavern and at Hamburg's Star Club around 1960-64. The memorable early Merseybeat hits in their repertoire are tackled with genuine gusto, but so too are the rarely performed numbers off albums, EPs and B-sides that The Shakers like to dust off. The Shakers also bring the clothing styles of that early '60s era to the stage, complete with the black waistcoats and boots. Merseybeat legend Kingsize Taylor said after seeing The Shakers in action: "I haven't heard a sound like that since the Star Club in 1962!" The Shakers hail from the home of Merseybeat, Liverpool, and have been building up a strong fan base since their formation four years ago. On Merseyside they have become firm regulars at The Cavern and Beatles celebrations, and their reputation has spread internationally to win them bookings at major events in countries like Bahrain, Italy and Switzerland. 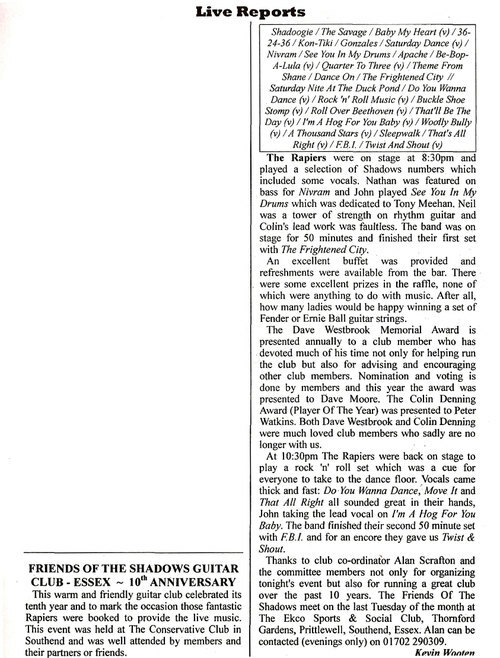 At the time of writing two ladies from Watford, both newish converts to The Shakers, were about to set off by rail to see the group do a prime Saturday performance at The Cavern. That's a distance of nearly 200 miles and some compliment to the group. "Basically the reason for putting The Shakers together was because I wanted to get back to the raw energy and sound of Merseybeat when it started," the band's leader and drummer, Tony O'Keeffe, said in an interview with The Beat. "I had seen all these '60s acts, which were great and entertaining, but the sound never quite resonated with me as being authentic enough. It was always a little bit too polished and I thought that's not what is on the record and I'm sure it wasn't what was going on in The Cavern live. So The Shakers were meant to be representative of the live Merseybeat '60s sound, which is what I think we've achieved. We've wanted to keep that energy of that period there. We've been quite lucky in that we've managed to establish ourselves quite quickly on The Beatles and Merseybeat circuit and we've been to Italy a couple of times, Switzerland and Bahrain. That has involved a lot of Beatles festivals which is quite good to have as a recommendation and seems to show we have built up a good reputation." Tony is particularly delighted to see a loyal fan base grow and grow for The Shakers. "We have regular people who come to all our gigs on the Liverpool circuit and we also get people who visit websites and stuff who follow us elsewhere which is great. It's always nice to have familiar faces at gigs wherever you are." Since starting up in 2005, The Shakers have just recently had their first personnel changes. Tony and lead singer and guitarist Eddie Harrison remain as the originals and are now joined by George Burton (vocals/guitarist) and Martin Davies (vocals/bass guitar). "Basically, I think any band goes through this. Even The Beatles had various line-ups before the one that we all know. A lot of our favourite bands have been through the same thing and these days even many of the '60s bands have just one original member along with various floating members. We're not exempt from that. For various reasons things happen—people have other demands in their lives or are not committed or it's not what they want to do. As far as I am concerned, as long as The Shakers' name is around I hope it will be a mark of quality for that raw Merseybeat sound. It doesn't really matter who is doing it as long as that is still preserved and I think we have managed to do that. That is all that matters really." The two "new boys" have excellent pedigrees to become Shakers, with George having served in leading Scottish Beat group, The Beatcombers, and Martin having been a stalwart with Colin and The Persuaders, a top UK rock 'n' roll band. "George has fitted in very well and we're all enjoying it. The Beatcombers have done the standard Beatles festivals but they've also tended to play the more obscure material and have had a couple of albums out—this has won them a good reputation on the circuit. "Martin was with Colin Paul and The Persuaders for about 12 years. He is a great guy and is a left-handed Hofner player like Paul McCartney and absolutely loves what we do." One of the highlights of Tony's year was The Shakers doing a sold out show as guests of The Rapiers at the Amersham Rock 'n' Roll Club in May. A long-time admirer of Colin Pryce-Jones' classy Beat combo from north London, it was Tony's first chance to perform on the same stage with The Rapiers. The Shakers went down a storm with the audience and Colin kindly called them back on stage just before the end to take another bow. "It was a complete honour to do the show. I'm a fan of The Rapiers anyway and it's always great to play with people you admire and like. I've always admired their way of doing things and the fact that they stick to that. It's very much a template for what we do, but obviously we're different in our way as they are to us. It was a wonderful night, we had a good reception and that is as much as we could ask for. It was just a complete buzz playing with them." 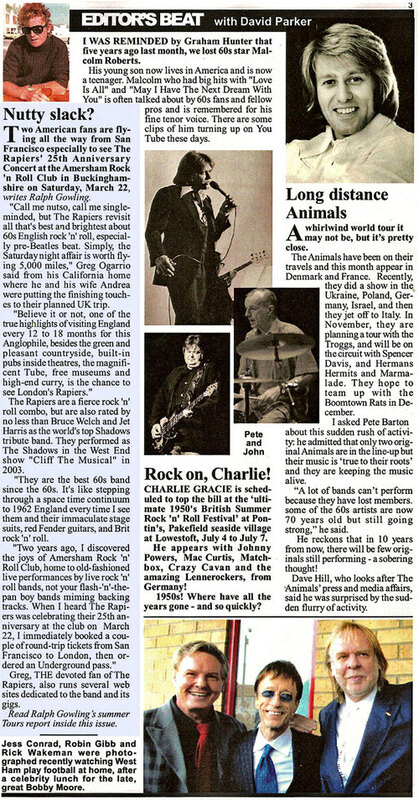 Always a faithful champion of Rapiers happenings, David Parker's The Beat amps up the twang this month with a review of not one but two new theatre shows steampowered by our lads, a reconstituted Me and My Shadows and Back in Our Rock 'n' Roll Days, both featuring harmonist extraordinaire Tony Rivers. For a close-up read, click anywhere on the article. Then, as a show of support for a publication that ain't afraid to spill ink for The Seekers, Jack Jones and Alice Cooper in the same issue, consider subscribing by emailing Mr. Parker today. Joe Meek Weekend a "Top Hit"
Reporter Gary Bills-Geddes gets things right in today's Ledbury Reporter, based in Worcestershire. A LARGE audience at Newent Community School certainly hadn’t forgotten John Leyton, the 1960s star of hits including Johnny Remember Me. Mr Leyton, now aged 69, was the star attraction of the town's Joe Meek Celebration Weekend, because his most famous hit was produced by Newent's most famous son. Now a Joe Meek celebration looks set to become an annual feature on the town's calendar. Peter Street of the Newent Initiative, which organised the event, said: "It was out of this world. 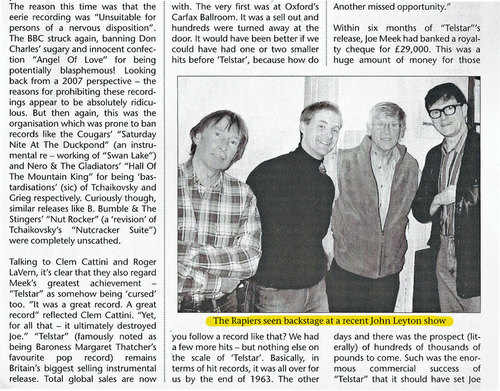 John Leyton, while on stage, seemed as young as ever and an audience of over 200 people were spell-bound. "He sang very well indeed, and The Rapiers who backed him are as good as The Shadows, in my opinion." Some of the audience had travelled from as far afield as Holland for the concert. In between songs, Mr Leyton talked about his memories of Joe Meek, and also of other famous people he had known, including Frank Sinatra and Adam Faith. Another big attraction was a display of vintage cars in Newent town centre on the Saturday morning. Many of the vehicles dates from the Sixties, the era of Telstar and Joe Meek's ground-breaking innovations in music recording and production. Mr Street said: "It's put Newent on the map." 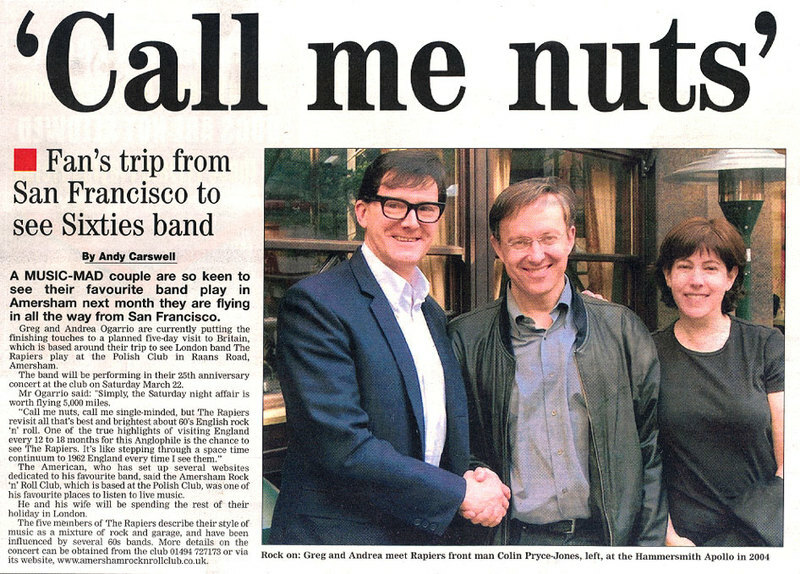 Editor David Parker's Beat Magazine ("your kind of music monthly") promises a prize for the funniest caption to this Rapiers-meet-Sir Cliff Richard photo featured in the August 2008 issue. The scene is last month's 50 Years of Cliff Richard and The Shadows night at the Runnymede Hotel in Egham, Surrey, a benefit for the Caron Keating Foundation. Massively way cool, The Rapiers backed Cliff on The Young Ones. Cliff meets the new Shads, same as the old Shads. Cliff again ignores the fellas' morning fashion call to "wear the blue suits". In a rare moment of group disharmony, drummer John Tuck bristles at guitarist Neil Ainsby's suggestion he let Cliff cut in front of the buffet queue. Email witty suggestions to Mr. Parker at davidoparker@aol.com. 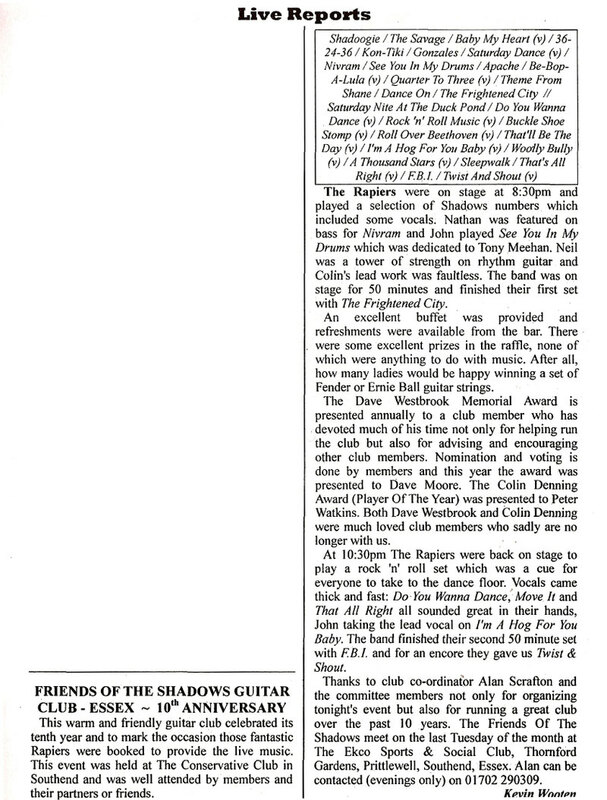 Belatedly I found this succinct what's on music note online in the Isle of Wight County Press. ON MONDAY night, 50 Years of Cliff, starring Jimmy Jemain, opens a short season at Shanklin Theatre. It can also be seen on Mondays, August 4, 11 and 18, at 8.15 pm. Jemain, who won TV's Stars in Their Eyes, as Cliff, and also played the legendary British singer in a West End musical, will have Britain’s foremost Shadows sound-alike band, The Rapiers, as his backing group. They will have a solo spot in this production. Swoon and sigh: Is there anything more evocative, more urgent than reading "[entertainer] opens a short season at [venue]"? Almost makes you feel guilty if you don't book. "Janet Hemingway reveals how she loved Shadows bass player Jet Harris from the moment she asked for his autograph outside a stage door—but had to wait 45 years for him to fall for her." Holy reprise, Batman! Seems the two Yanks in Amersham angle has legs. 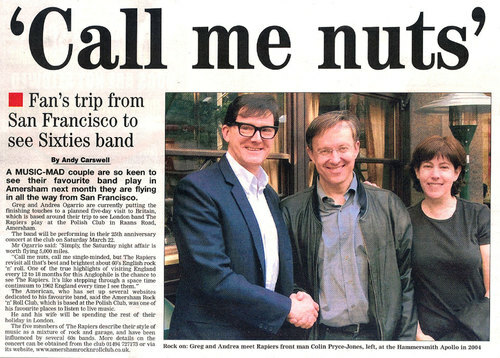 From David Parker's Beat Magazine, March 2008. BTW: Rapiers were not was. Clipped this Kevin Wooten review of a private 2007 Rapiers show from current issue of Pipeline Magazine, purveyor of all-things instrumental. BTW: A reminder that Pipeliners are staging their annual convention, featuring five top gear combos, Easter Sunday in Bushey, near Watford, the afternoon after The Rapiers' 25th Anniversary show in nearby Amersham. Sounds like a real instrumental hangover is on tap for Monday. Maybe it was a slow news day, maybe only junior editors were on desk duty, but a recent Amersham and Chesham Bucks Free Press front page got wind of my latest overseas adventure, re-jiggling another mention from the paper's network. 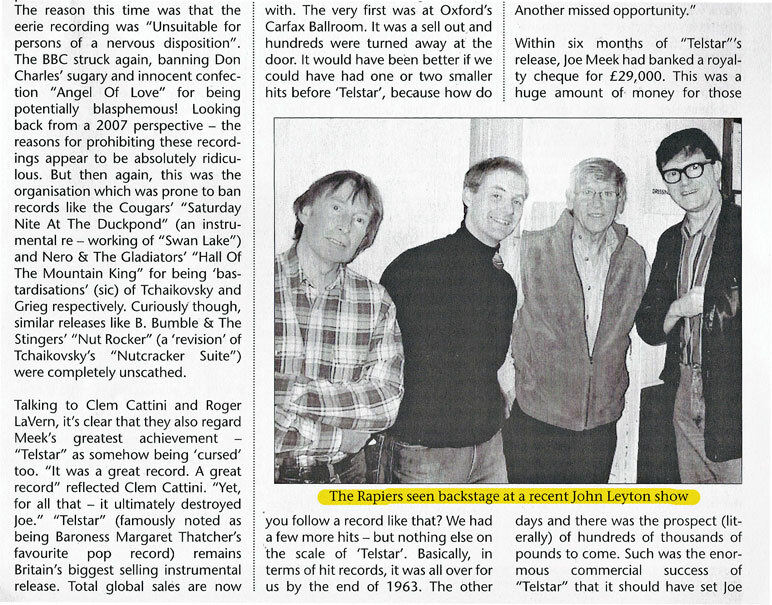 Thanks to Rapierspotters Roger and Val White for clipping, scanning and forwarding the piece. Good news: The Whites are bringing a dozen friends to the 22 March Amersham anniversary show. 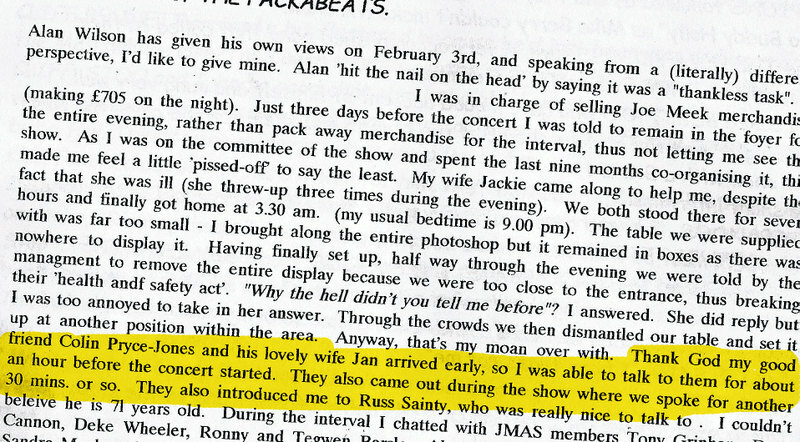 Correction: Location of handshake was actually across the street from the Hammersmith Apollo, before a 2004 Shadows reunion concert, at the Trout pub. Colin Wood, ex-Keith Powell and The Valets (see: Birmingham, 1963) snapped the picture. 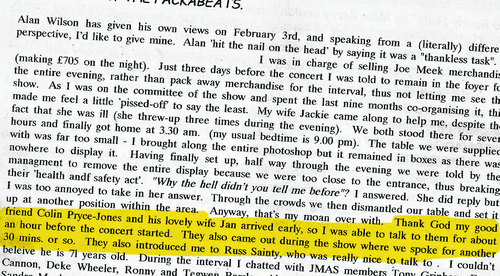 Joe Meek Society Newsletter editor Mark Newson name checks his favourite rock 'n' roll combo at the drop of a plectrum. So it's no wonder his group's latest A4 sheet (No. 144, July/August 2007) reminds us that next year marks a quarter century of Rapiers. The Amersham plug is news to me. But it makes sense. Fellow Rapier fan Ralph Gowling holds court at this cozy Buckinghamshire club, organising rock 'n' roll parties like the upcoming '60s Gold Night Spectacular with The Honeycombs, Love Affair and Vanity Fare (20 October), Elvis & Shakin' Stevens Night with Ricky Aron and Good Rockin' Tonight (10 November), and a Christmas '60s and '70s Gold Show with The Fortunes and John Leyton (8 December). Supporting live music "up close and personal with the artists" is this club's credo, as well as "drinks at club prices instead of high theatre prices!" Chin-chin! I know whence this uncredited image comes, reproduced in the March-April 2007 Joe Meek Society newsletter. I snapped it on my meek-ish 2.1 megapixel Canon digital camera after a Rapiers-John Leyton shindig on the England South Coast last fall. Americans in Bognor Regis. Ha, ha! Sounds incongruous, near twaddle to native Brits, but I stalk The Rapiers where I must, enduring yobs drinking, smoking and yammering in our train compartment down from London Victoria, near freezing, wind- and rain-swept pavement outside the Butlins gates, 90-minute taxi rides back to Notting Hill, London round midnight. Mere trifles when I can savour two minutes of Buckleshoe Stomp firepower from Colin, Neil, Nathan and John during their precious two-song solo set before they welcome John Leyton to Butlins' downstairs stage during the camp's Festival of the '60s weekender. Eight days removed and the jet lag hangover fading, I still have Neil's chopping, Mick Green-like chording attack and Colin's stinging, metallic soloing teasing my head. Plus those near maniacal, massed group vocals on the chorus. Mark Newson wasn't enjoying his exile to the foyer at the Wyllyotts Theatre in Potters Bar back on 3 February during a tribute marking the 40th anniversary of the passing of producer Joe Meek. In the latest ish of the Thunderbolt, the Joe Meek Society's quarterly magazine, Mark, its editor, throws a fair wobbler in print. Fortunately, some friendly faces from Rapierdom offer brief relief.